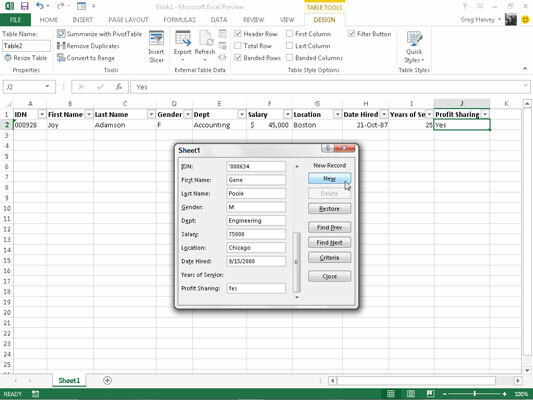 Excel 2013 allows you to add records to data lists by using the data form. The first time you click the custom Form button you added to the Quick Access toolbar, Excel analyzes the row of field names and entries for the first record and creates a data form. This data form lists the field names down the left side of the form with the entries for the first record in the appropriate text boxes next to them. You can see the data form for the new Employee Data database; it looks kind of like a customized dialog box. The data form includes the entries you made in the first record. The data form also contains a series of buttons that you use to add, delete, or find specific records. Right above the first button, the data form lists the number of the record followed by the total number of records. When creating new entries it will display New Record above this button instead of the record number. All the formatting that you assign to the particular entries in the first record is applied automatically to those fields in subsequent records you enter and is used in the data form. For example, if your data list contains a telephone field, you need to enter only the ten digits of the phone number in the Telephone field of the data form if the initial telephone number entry is formatted in the first record with the Special Phone Number format. That way, Excel takes a new entry in the Telephone file, such as 3075550045, for example, and automatically formats it so that it appears as (307) 555-0045 in the appropriate cell of the data list. 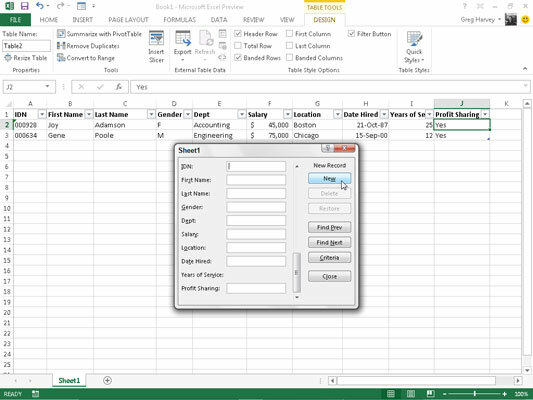 When entering dates in a date field, use a consistent date format that Excel knows. (For example, enter something like 7/21/98.) When entering zip codes that sometimes use leading zeros that you don’t want to disappear from the entry (such as zip code 00102), format the first field entry with the Special Zip Code number format. Press the ↓ key when you’ve entered all the information for the new record. Or, instead of the ↓ key, you can press Enter or click the New button. Excel inserts the new record as the last record in the database in the worksheet and displays a new blank data form in which you can enter the next record.